What Is An Artist’s Museum? The Dali Museum celebrates the life and work of Salvador Dali (1904-1989) and features works from the artist’s entire career. The collection includes over 2,100 works from every moment and in every medium of his artistic activity, including oil paintings, many original drawings, book illustrations, artists’ books, prints, sculpture, photos, manuscripts and an extensive archive of documents. Founded with the works collected by A. Reynolds and Eleanor Morse, the Museum has made significant additions to its collection over the years. In 1942, the Morses visited a traveling Dali retrospective at the Cleveland Museum of Art organized by the Museum of Modern Art in New York and became fascinated with the artist’s work. On March 21, 1943, the Morses bought their first Dali painting, Daddy Longlegs of the Evening, Hope! (1940). This was the first of many acquisitions, which would culminate 40 years later in the preeminent collection of Dali’s work in America. On April 13, 1943, the Morses met Salvador Dali and his wife Gala in New York initiating a long, rich friendship. The Morses first displayed their Dali paintings in their home, and by the mid-1970s decided to donate their entire collection. A Wall Street Journal article titled, “U.S. Art World Dillydallies Over Dali,” caught the attention of the St. Petersburg, FL community, who rallied to bring the collection to the area. The Dali Museum, St. Petersburg, FL opened in 1982. The distinguished new building, which opened on January 11, 2011, enables the Museum to better protect and display the collection, to welcome the public, and to educate and promote enjoyment. 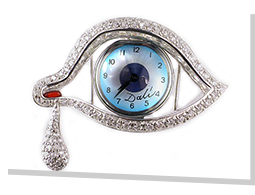 In a larger sense it is a place of beauty dedicated, as is Dali’s art, to understanding and transformation.